Energy neutral operation is a mode of operation where the energy consumption of the node is always less or equal than the energy harvested from the environment. Once in this state, the sensor is capable of operating perpetually. 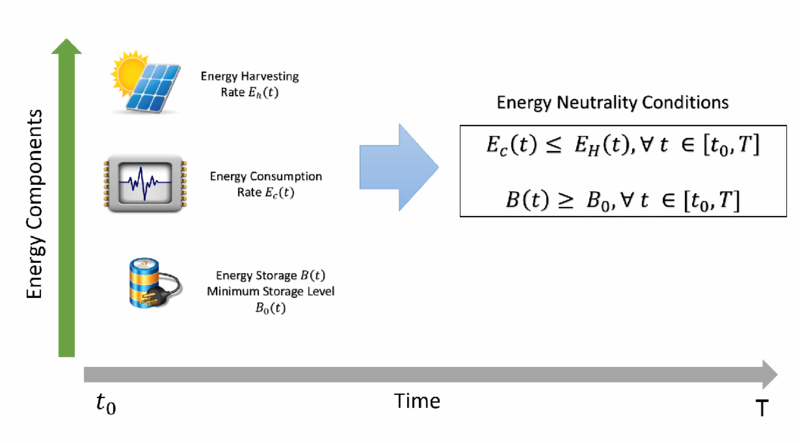 In order to achieve energy neutral operation, energy optimisation methods need to fulfil the energy neutrality constraints while maximising performance. Energy neutrality constraints deals with the relationship among the three different types of energy: the energy harvested by the harvesting device, the energy consumed by the sensor and the energy stored in the battery/supercapacitor. This relationship can be described through mathematical models, which helps to understand the energy behaviour and the amount of available energy for the next time slots. These models can then be used by an optimisation algorithm, such as an energy-neutral MAC protocol or task scheduling, to dynamically adapt the sensor or network behaviour. An energy neutral optimisation methodology, therefore, must have an optimisation algorithm associated with a good energy model in order to achieve better results.